Bench grinder, arbor speeds and power set up questions - The Iron Forge Fire Blackmithing Forum. Hello, Long time returnee here. I have a new little project with a flexible shaft grinding attachment. I am not fond of holding those big baddy grinders angle grinders (mine is antique and weighs like 20 lbs) so I am hoping with this I can increase the comfort but maintain good power and control using a flex shaft grinder. its a heavy duty one that attaches to a 1/2'' motor shaft. The hose I have is only 4' long so I don't have much reach to work with, the others I have seen are 6-8 feet. I am considering whether to use what I have which are 1/4hp motors, or go and buy a 1/2 hp. With the 1/4hp motor I would use it more mobile by having a stand that basically is a multi height coat hanger to hang it from at different work areas depending on what height I was needing to grind on a project. Or I could go for the larger motor and build a mobile stand that uses an old grinding arbor. One side using a normal stone and the other free to use the industrial sized the flex shaft. Not exactly sure what your trying to do. Those little hand held flex shafts are made for small work and couldn't handle a lot of power. Not to mention it might be dangerous to have a 1hp motor pushing it. Sorry for my miscommunication, I edited my original post to hopefully make more sense of it. In my mind I thought I did, but I never reread my post before posting to see what people might have thought too. Will keep that in mind. And safety is always pretty big, I think 1/4 hp is fine enough for me. How about a few pictures... ! I agree with Jim, applying too much power to the flexible shaft may unravel the drive system, especially if the rpm's are too high. If we could see the Flex Shaft Setup, and how it will attach to the Motor, someone could be more specific when answering ! AND... to basically answer the question, using an Arbor to attach the Flexible shaft and a regular grinding wheel isn't a bad idea, I've thought along those lines too, but the big questions are, the flexible shaft attach safety to the Arbor and will the shaft handle what the power you have in store for it ? Please post some picture, hope someone can help you out ! p.s. I have a Flexible Shaft Grinder I used on Brass Model Train Engines, working small details and the motor for that was around 1/8 hp and it turned some decent rpms. These are ether things you need to know, how much hp was the flexible shaft designed for; what is the rpm range of the flexible shaft ? Ok thanks for taking the time to reply, So I got a pic for ya. Though I am not as enthusiastic about taking pictures with my phone as I am with hitting metal with a hammer. These are the parts I am considering using, although I do have another 1/4 motor and larger arbor I am considering using too. The flex shaft itself if about 1" thick and 1.5" at the handles. I like it because of the freedom of movement I think I can get to sand/ wire brush hard to reach areas without having to hold up a heavy Safety wise I will make a sheet metal shield clamped to the handle with either a switch on it, or a foot pedal power on off. I guess using a dimmer switch not a good idea for variable speed/power but.... is it? So I was either going to build a little stand, or just use it attached to the motor and allow the motor to be hung from or near where ever I am working. 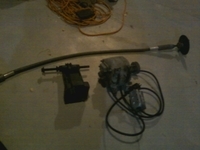 I have seen these on ebay and craigslist hooked up to 1/2hp and even a remmington model on ebay currently for 3/4hp. Wow, I had no idea that they made a remote grinder of that size ! I have seem the smaller "Hobby" version, and I think a Pro Level Unit but nothing as big as you have linked. IMHO... the picture in your post is more like a Pro Level Unit, bigger than a Hobby Unit, and it looks HD. Just be careful with the applied pressure to the grinding wheel because the torque of the wheel will be transferred tot eh cable drive if and/or when the wheel/cutter jams. When using a standard Motor adapted to the Cable Drive System you have two problems, RPMs and Torque Output, so be careful which motor you decide on. It would be good if you had the Spec's on the Cable Drive/Grinder. It should work OK, BUT keep in mind SAFETY. SAFETY, SAFETY, when using a non-standard motor and actually grinding with the Tool. I can think of a few time something like this would have come in handy... Luck with the project ! Keep posting Pictures, this will be interesting to see how it comes along while you are building it.